A simple question that only offers even more questions once answered, since there are a lot of things to be considered when it comes to figuring out where to place a dressing table in your bedroom. Firstly, we’d like to start off by giving you some common and most optimal locations as to where you can place your current or soon to be new dressing table. This will apply to you regardless of how large or how small your bedroom is. 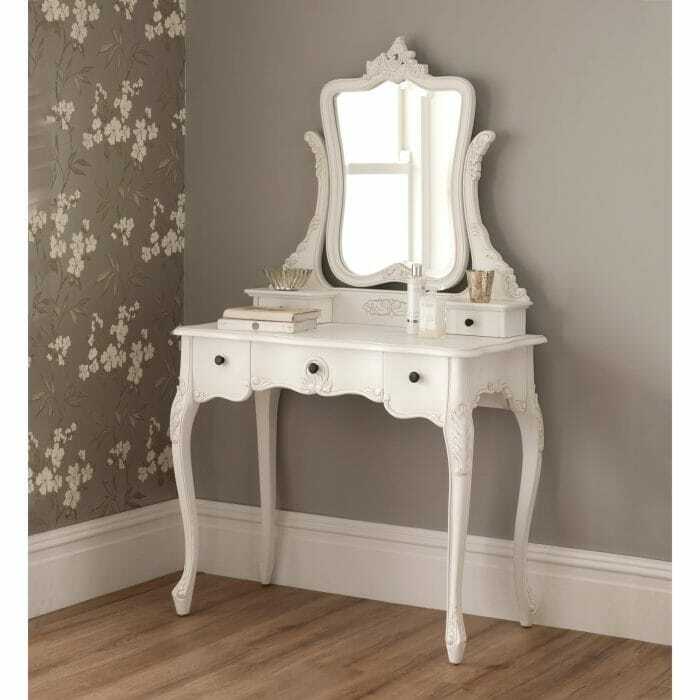 One of the most common places for your dressing table to go is next to your bed, this is usually typical for those who lack extra room which may be already taken up by a range of antique french style chests, contemporary tallboys or whatever it is you’re currently using to add style and practical design to your personal haven. Typically placing your dressing table in this locations means that you’re replacing the bedside table in your bedroom, which is completely fine as long as the dressing table features drawers which are large enough to hold all of your personal necessities. Now, you have 2 options here, and this depends on the room you have available to you and ultimately, like all of the options, down to preference. Option 1: Facing the wall; this position is the most favoured of the two, I think because you get to hide the usual eyesore of the backs of a dressing table, which is never usually decorated like the rest of the unit. Option 2: Back to the wall; this is the least popular but is most common in rooms that lack a good size. With the back of the dressing table facing the bed, you may have the undecorated side on full display (depending on how the designers have gone about finishing the unit) but beyond this, it’s not a bad way for you to properly optimize the low amount of space you already have. Now this very much depends on the style of your dressing table but we believe this is one of the most underutilized ways of featuring any kind of dressing table in your bedroom. If you’re thinking about purchasing a dressing table that doesn’t feature some form of backboard, which would obviously block out the light, we urge you to give it a go and place it against a window. This is because, using your dressing table to apply your makeup or just to study, you’re going to need some light to help you with either one of these tasks and what better light is there than the natural light that shines through your window? Now, it has to be said that we wouldn’t recommend placing your dressing table against a window if there was a radiator underneath, as you will be trapping the heat that it produces, making it a terribly uncomfortable place to be in the winter time. The other spots mentioned have taken mostly the amount of room you have available into consideration, this one thinks about both space and style. Placing your dressing table between bigger units such as a wardrobe or a chest will not only make the furniture piece standout so that all the attention is drawn to it, making for the perfect focal point, but it will also allow you to take full advantage of what room you have left to use that would otherwise go unused and be wasted. These are some common and some of the best ways for you to feature your dressing table, taking into consideration the space and the style of your bedroom, and what sort of home accessories and furniture you already feature. But as we’ve mentioned, you should pick a setup based on the style of dressing table set you have or are looking to get, whether that’s an antique french style or one of a contemporary range. First read about some of the other options that are out there which could really spruce up your bedroom area. There are many styles of dressing tables to be considered before you jump the gun and purchase one, you’ll need to take into account what style of furniture you feature in your bedroom already such as your chest of drawers and bedside tables as well as the styles your other rooms feature like in your lounge or dining area. But that should be obvious. 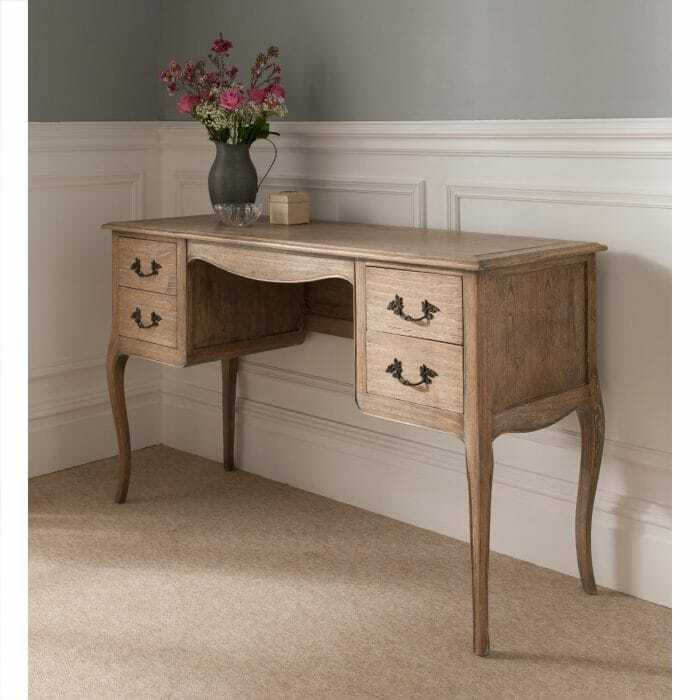 Probably one of the most popular types of dressing tables and in our complete biased opinion one of the most beautiful choices for any bedroom. Whether you’re featuring it in white, gold or silver, there will be an antique french dressing table that can really attract the eyes of anyone who enters your personal haven, which make them great as a focal point. At HomesDirect365, we feel like with any piece of furniture you buy, you should at least be a little bit educated in the origins of the design, just so you can feel more connected with your purchase and truly appreciate it more. So, what is the story behind antique furniture history? The antique french furniture style which is mainly bought by collectors, due to their now considerable age which reflects the period in which they were created. Unlike contemporary furniture, which is made purely for the state of providing the user with some form of benefit, whether that’s extra seating or additional storage, antique french furniture was made as a sort of ‘artistic design’ as you can see through the curves and hand-carved details most piece were designed with. Most antique french furniture has been styled from that of the late King Louis XIV during his reign. This is because these particular furniture pieces featured all the things previously mentioned, making it an ideal addition to any homeowner seeking a luxury finish, and it still is collected for these exact reasons today. A close second to antique french style, is that of the shabby chic design. 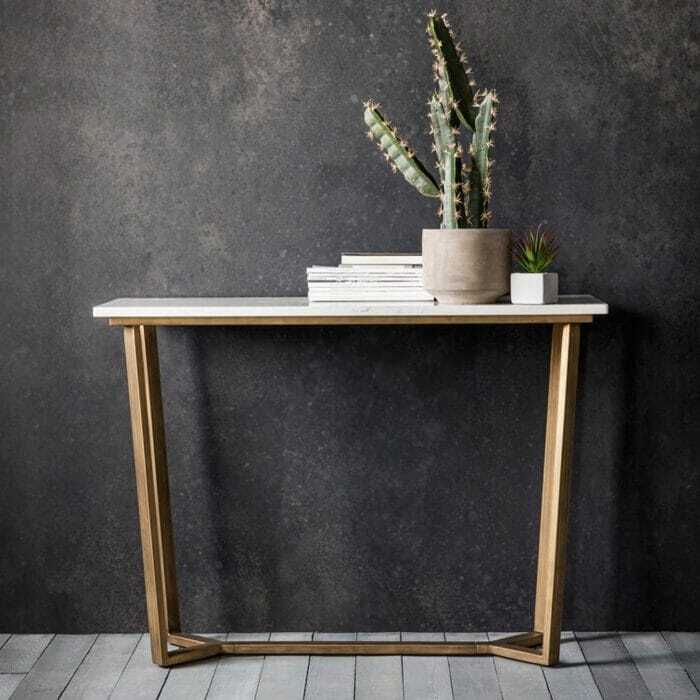 Although many people seem to confuse the two and sometimes assume that they are one of the same, it does not take away from the fact of how beautiful this style of dressing table really is. The difference between this style and antique french is that shabby chic furniture is typically designed to look aged and in this case, the furniture can typically be of higher quality since it doesn’t go through a ‘natural’ aging process. Finding its peak popularity in the 1980’s, shabby chic style was furniture that featured some form of natural but most times deliberate wear and tear which was then used and arranged in a way that would give off a stylish finish. Commonly decorated with more pastel colours, this almost bland style was once seen in every home across Britain and America. Shabby chic furniture was considered more stylish than fashionable, which gives your home a unique look, especially in today’s modern world where contemporary furniture has spread like wildfire Shabby chic can be added to bring back the stylish design. Because of the ‘rules’ of shabby chic style, where you just want something that looks old, rather than it actually being so, you don’t have to have deep pockets to be able to feature this style of furniture in your home, truly an accessible style for all people looking to finally have a home they can be proud of. Although common in today’s modern homes, contemporary dressing tables are truly a unique piece amongst all dressing table styles. This is because they follow no set rules like shabby chic or antique french furniture do, except it’s all about ‘now’ and the ‘future’. Because of this, designers usually get carried away whilst trying to create the newest and quirkiest piece. So, if you’re looking for something that’s going to fit into your bedroom and not completely take over a space, whether its large, small, round or anything else you can imagine, a contemporary dressing table might be what you’re looking for. Contemporary furniture is sometimes confused with modern furniture, although they are similar, they do have their differences. Modern furniture design refers to the era that has passed, typically anyway from the booming Art Deco trend of the 1920’s to the Vintage look of the 1970’s can be considered ‘modern’, which in the case of contemporary furniture design, certainly does not fall under this catch all term at all. Contemporary furniture however uses elements, mostly unique, to give it a quirky design and overall finish which allow each piece to be striking and totally unique from one another. Simply put, as long as the pieces look ‘new’ and of the ‘future’ then you’ve got yourself some great contemporary furniture for the home. Typically made from solid oak wood, Shrager dressing table is probably one of the most unique additional you can make to your home. Whether or not this is because it is an overlooked and undervalued design choice, the Shrager dressing table will make for a striking addition to any bedroom furniture collection. Usually featuring a round design, which can be seen from both the table itself along with the dressing table mirror it usually partnered with. This is one of those styles that requires a certain taste, making it a style for the minority. Stories, rules and design choices behind Shrager Furniture History is mostly unknown, unfortunately to the design world these are questions that are going to most probably be unanswered. But, thankfully we can certainly get an idea of what was going through the designers mind just by looking and appreciating the furniture they left us. As you may know, it is apparent the Shrager furniture features a solid wood design, which features round details that many dressing table designs to not untalize in today’s market or even that of the past. Shrager furniture is certainly an addition you’ll want to make if you love the style of big and bold. Now you’ve got a style in mind, a colour and even the size of dressing table. Next you’re going to want to identify what sort of table mirror and seating you’re going to want to complete the dressing table set with. These two pieces are a minimum requirement when it comes to having a dressing table in your home, since they can affect just how beautiful (or not) the dressing table is. So just like before, you’re going to want to consider a few options depending on your needs and of course, what you like the look of. 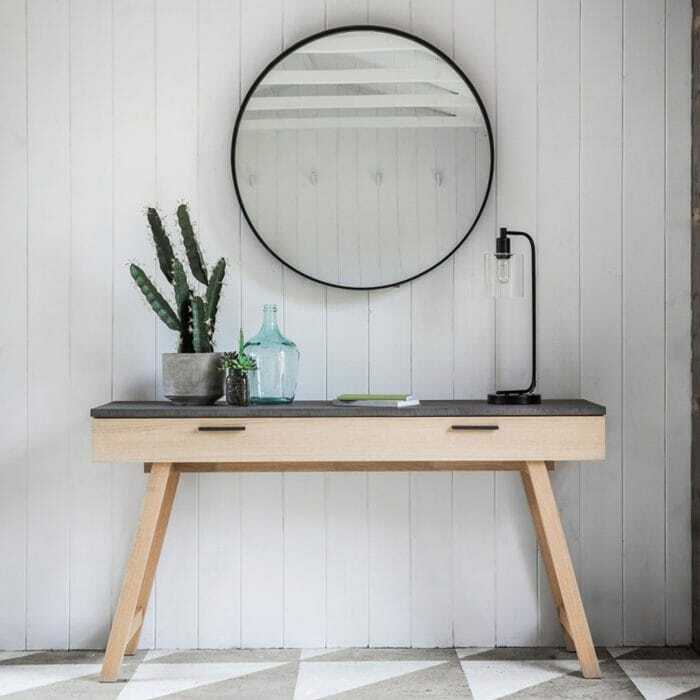 Now arguably as important as the dressing table itself, the dressing table mirror provides you with the functionality that the dressing table helps to compliment. Whether your uses of dressing table are going to be for applying your make-up, styling your hair or you just want to help spread light around the room, you’ll want to go ahead and make sure you match one with your dressing table. 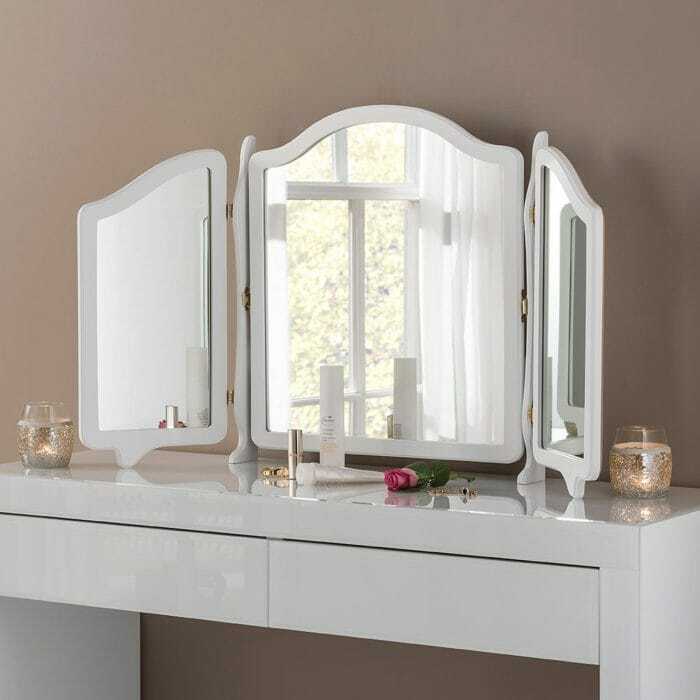 This choice depends on what you plan on using your dressing table for, each mirror offers unique benefits that you can utilize when you are using the mirror for whatever it is you may be doing, some offer aesthetic benefits and others are beneficial to your day to day life. The most common design, and probably the one you’ll see the most no matter the home you visit, the single mirror is a reliable type of mirror that offers plenty of viewing space for your everyday needs. 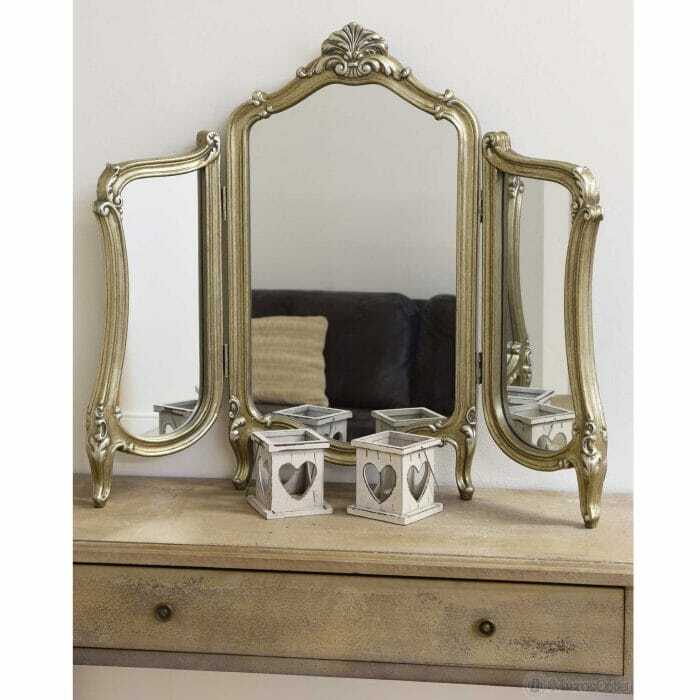 Offering charm and luxury, depending if you’re featuring a rounded or squared off design, the single mirror is a safe option if you’re not quite sure of what it is you’re using your dressing table for and what the rest of the room is going to look like with your new dressing table set within. With its 3 panel design, this dressing table mirror is going to be perfect to offer you all the angles you could need for applying your makeup and styling your hair. Typically you’ll see these three panel dressing table mirrors featured with some form of mirrored or venetian style around them, and usually the center mirror is the largest, since you’ll be using this one the most – additionally adding some extra character to the practical piece. 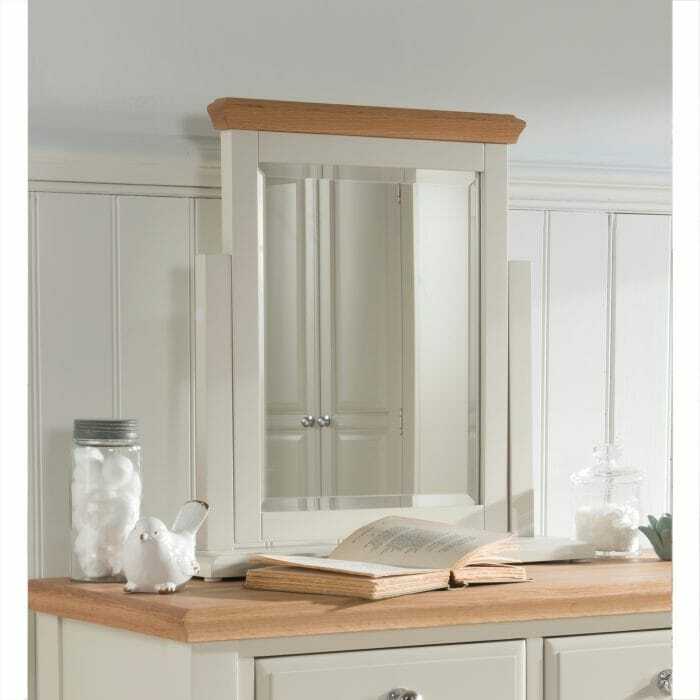 Similar to the three panel dressing table mirror in its design, the folding of this mirror is what makes it unique and slightly more practical than without it. You are able to move the mirrors in a way that is most optimal for you, just like your car door mirror. 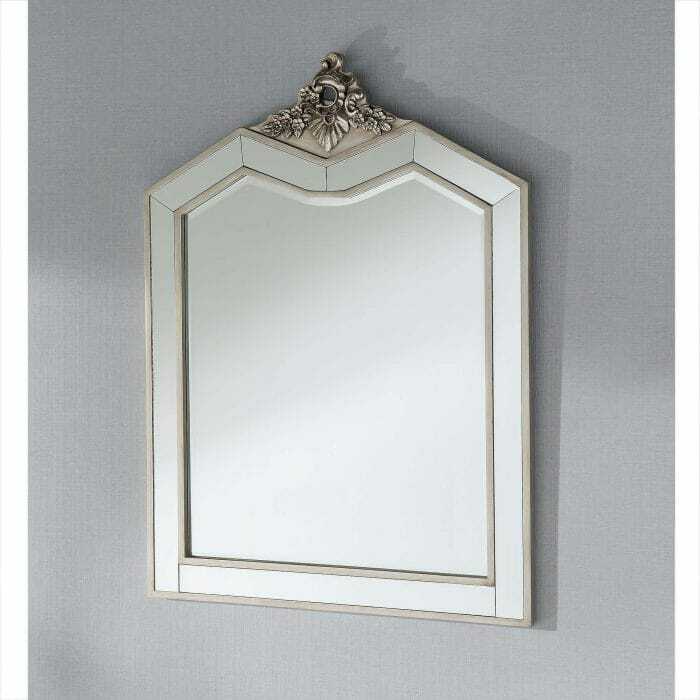 Although as previously, this style of mirror typically features some form of venetian inspired design, making it an addition that could overpower the rest of the room, depending on what furniture you already feature. This is one of those styles that no one seems to consider, but it’s certainly one that should be taking more advantage of throughout your homes. Adding your mirror to your wall offers you a greatly unique design, creating extra dressing table space as a way for you to fully take advantage of the bare space on your wall, which will help you to obtain a bedroom area that feels a lot more complete. 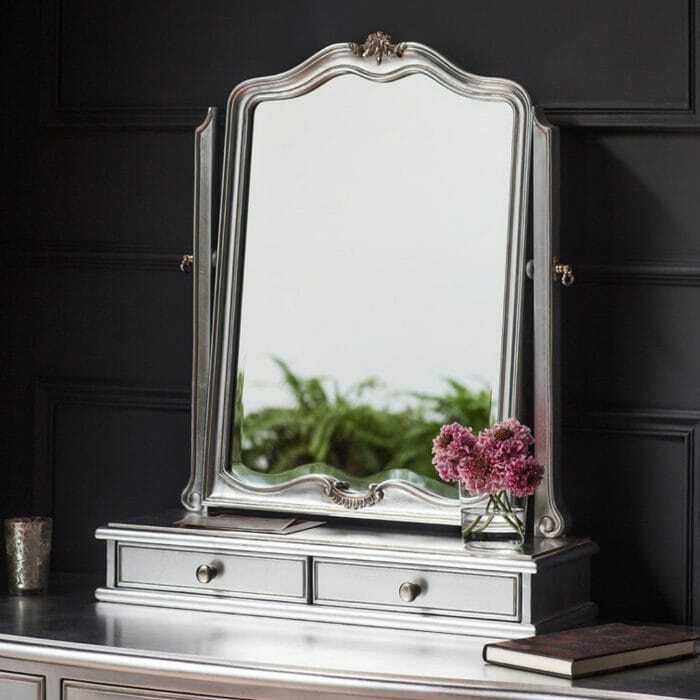 Typically you could play it safe and go for a style that is the same as your dressing table and the rest of your furniture, however they are options such as mirrored dressing tables that offer a bold and striking finish which could really help the set to become a focal point in your personal haven. 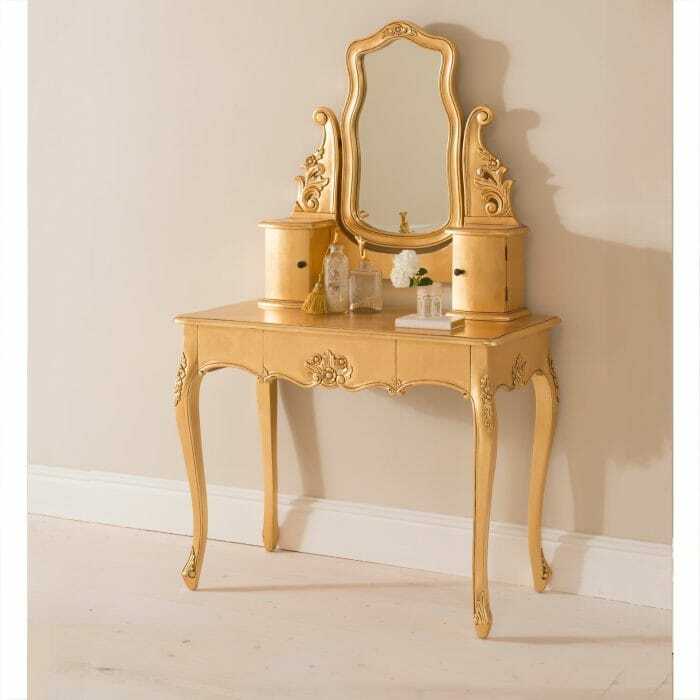 Sometimes referred to as a Baroque dressing table mirror, Rococo dressing table mirrors can come in all colours, typically in white just like other antique french style furniture pieces, it features ornate hand carved designs which can really help to spruce up any room and accentuate the overall design of the interior. 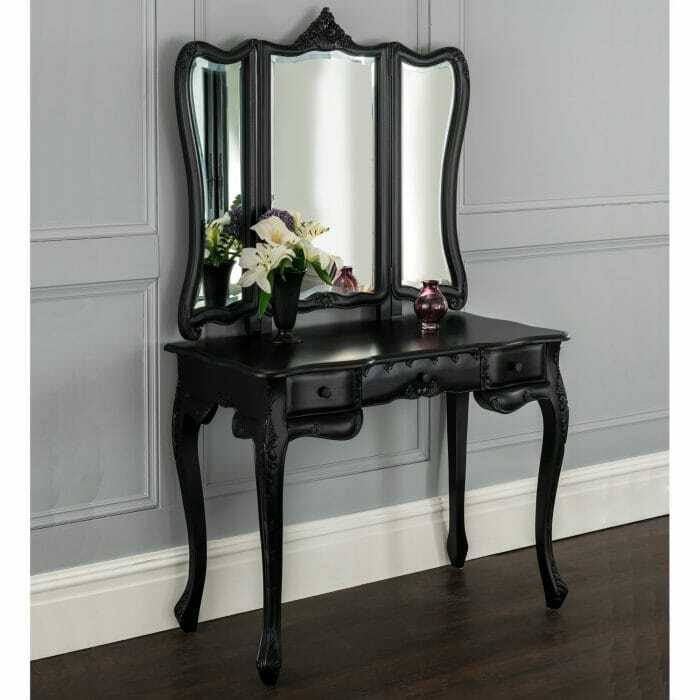 As you can imagine, gothic dressing table mirrors are usually featured in a dark colours, typically black to follow the ‘gothic’ trend. Featuring ornate details, just like the Rococo style except that they are more bold just as you’d imagine from such an alternative style. 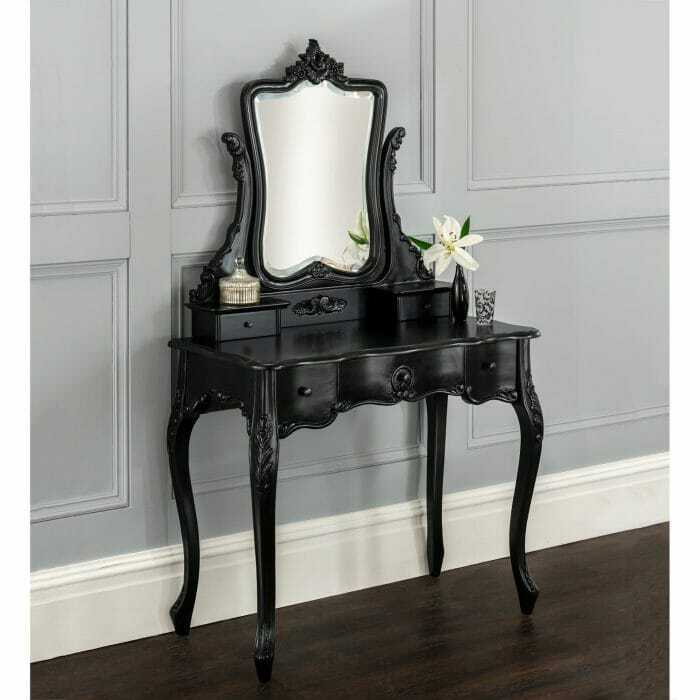 There is no reason ever to feature this dressing table mirror with anything other than a black dressing table, placing it with anything that is a shade lighter will allow the table mirror to overpower the rest of the space and negativity affect the room. As we’ve mentioned, venetian glass dressing table mirrors are one of the most common styles to be featured. Commonly because they fit any style of dressing table and never seem to overpower the room but they also provide your interior with extra lighting due to the extensive reflective capabilities thanks to its design. According to Vatsu, which is an ancient science used for betting living – its works can be seen in old and new architecture today – you should not face your dressing table mirror north or east, that is if you can help it. As this may reflect away positive energy that could be entering your home. For good health and an even better sleep, there should also be no mirror that face the bed, however if you can help it they should not be in your bedroom full stop…but let’s make an exception for the beautiful style that the dressing table mirrors provide just this once, shall we? Seating is as important as the mirror, you’ll want to be comfy whilst you apply your make-up, unless however you’re dressing table is right near a bed then you’ll be fine destroying the side of the mattress everyday whilst you use it…not! If you’ve got a dressing table, you’ll need some seating whether a stool or chair, to get the complete look. This, as usual, all comes down to how you’ll be utilizing your brand new dressing table. If you’re someone who needs a little extra back support because you’re spending plenty of time at the table, then there’s seating for that. If you lack the room for a chair and want to be able to hide it away under the table when not in use, then there’s seating for that. 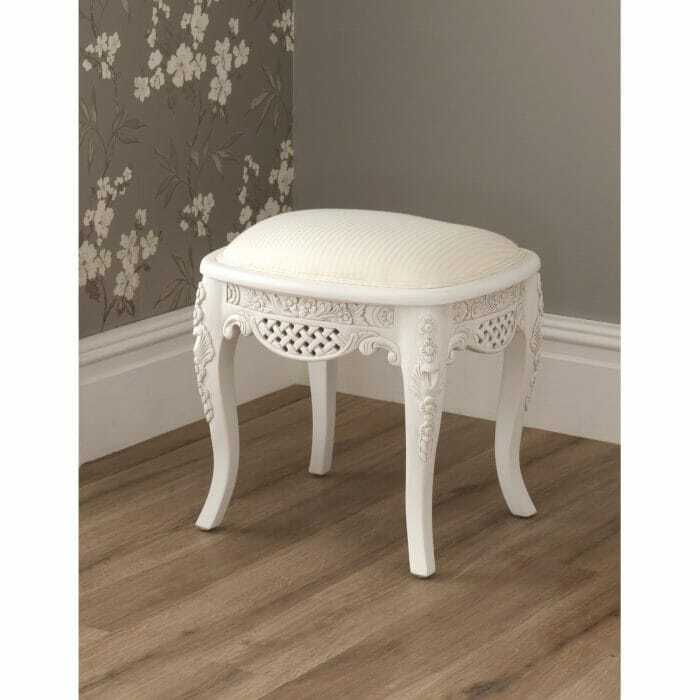 Commonly used with all styles of dressing tables, dressing table stools are going to be your ideal choice if you’re lacking the space for anything larger and more luxurious, however don’t be fooled. Stools do just as well as complimenting the dressing table and mirror as any other seating piece would. The huge advantage with dressing table stools is that because of their size, you’re able to push them under your dressing table when not in use, keeping the space clean and tidy throughout the day. 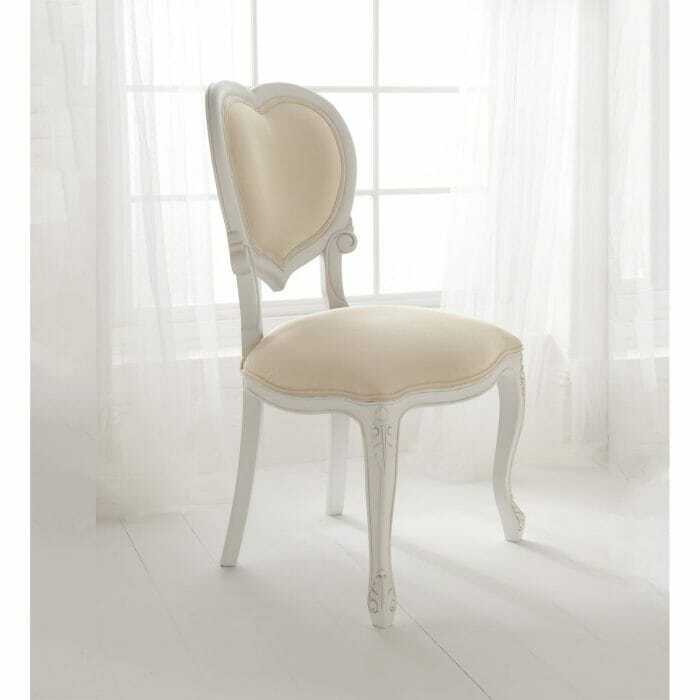 You’ll need plenty of space if you’re wanting to incorporate a dressing table chair into your dressing set. They take up a decent amount of room and are unable to be pushed underneath the dressing table as a stool would be able to. However what you may lose in bedroom space, you more than make up for in luxurious design. Because of their larger size, they can be decorated to make for a standout piece that is going to work just as well on its own. Just like a stool, this small and practical seating option will take up a minimum space whilst in use and almost none when its put away. 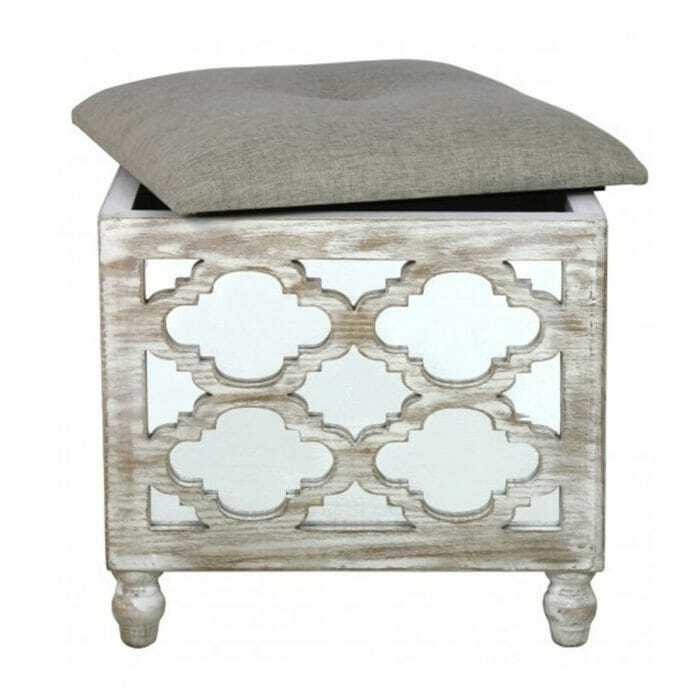 It’s advantage over a normal stool is that it provides your personal haven with some extra storage space which is certainly a great advantage if you’re lacking storage for all of your precious personal belongings. Finally, you’ve indenifted your dressing table, a great dressing table mirror to compliment and luxurious seating that’s going to tie it all together, but now what? Well it’s time to get your dressing table layout sorted, most importantly you want to figure out how everything is going to look once its in your room, where you’re going to put your makeup brushes, what you’re using your drawers for and all the rest of it. Here are a few things for you to consider so you can get your dressing table looking all neat and tidy and ready to be one of the most handy pieces of furniture you’ve ever added to your home. First, you’re going to want to choose the things you use the most, keep them out on display, out of their boxes, drawers and on top of your table. This may seem messy if you haven’t got it laid out properly but the main benefits of this is so that you can get on with your morning routine as fast and as effective as possible. Having all the tools out in front of you is the best way to do this. Perhaps get creative and find out how you can make your own diy dressing table organiser if you’re wanting to add a personal touch to your table top space. Accessories are meant to be pretty, and we can bet your jewellery is no exception. So why hide them away in closed boxes and drawers when you can display one of your favourite pieces for all to see? Take note, this does not mean you can get about cluttering your new dressing table with random bits of jewellery, we urge you to have some organization here. Place them in something like a dressing table jewellery tray to which is open for all to see but stores them in an organized fashion. Lastly, lighting is a must, even with your chandelier light and your bedside lamps on, you’ll still want some direct light on you whilst you get ready. So featuring a table lamp, desk lamp or anything that allows you to hone lighting in one particular area should be on your dressing table desk. But don’t forget, it’s got to look fashionable and coherent! And hide the ugly stuff! We all have things we need but do they really need to be on display? Perhaps not. Most dressing tables, whether french or shabby chic, come with a range of drawers, we suggest putting any things you do not want on display that could clutter up your dressing table and ruin the vibe. To some it all up, all that really matters is that your new dressing table is positioned in a place in your bedroom that is going to work for both the interior and with space in mind. 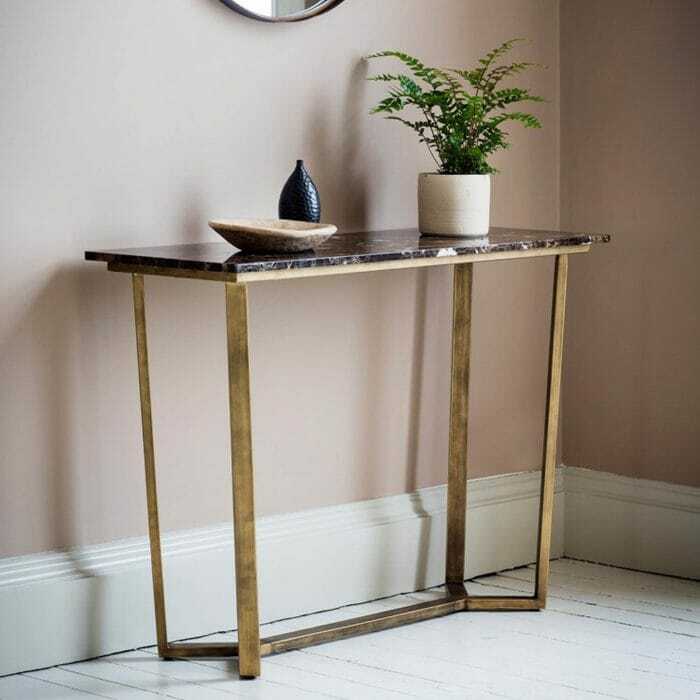 But, don’t neglect the other pieces that come along with dressing tables such as mirrors and stools, these should also be factored in when choosing a space for your dressing table. Not to mention what sort of items you’re going to be placing on the dressing table set and how you’re going to organise them.